Happy almost Friday friends! You all know how much I love to get a good workout in, but with my work schedule I find it much harder to get to the gym and especially classes. One of the things I miss most about my new hectic schedule is finding time for yoga. Not only does yoga allow me to center myself, relax and get a good workout in, it also means I get to wear cute workout clothes! 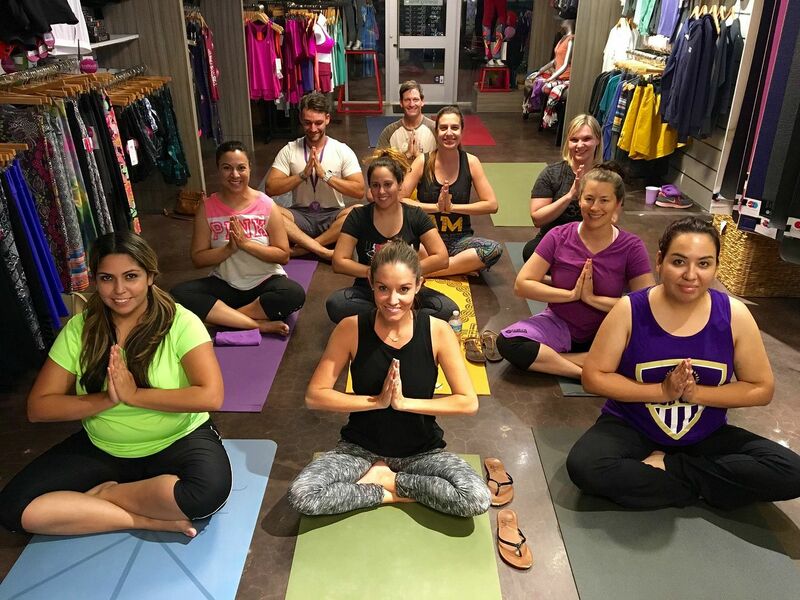 This week I was fortunate enough to join a group of wonderful ladies from the Central Florida Lady Bloggers to attend a private class at ballball Yoga Gear and Activewear. 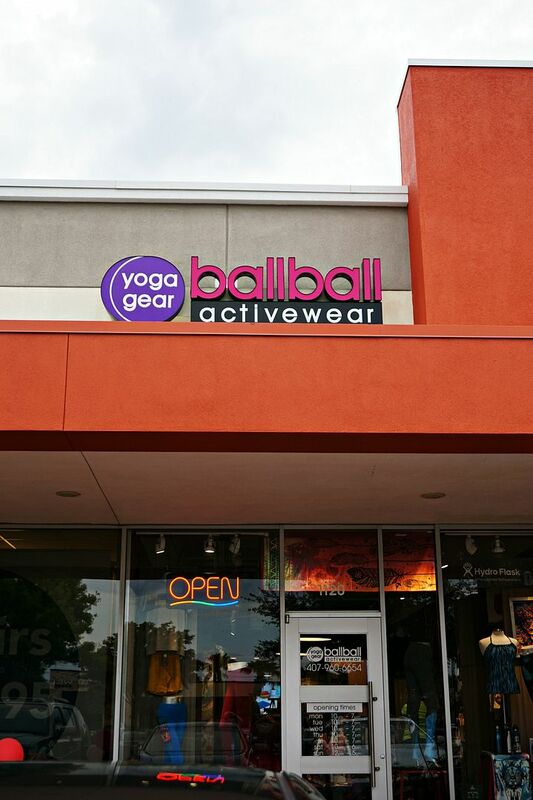 ballball is not your average yoga shop, it's a yogis heaven. 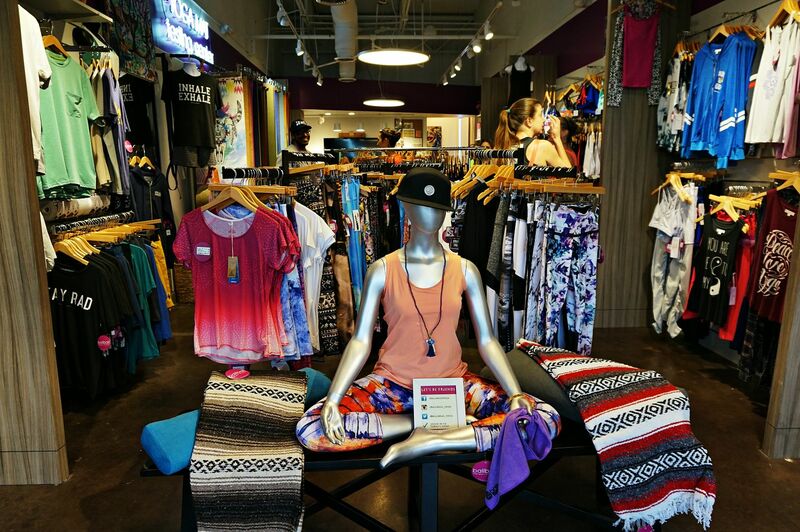 It's the only place that you can find over 40 different yoga and activewear/athleisure/lifestyle brands all in one store! 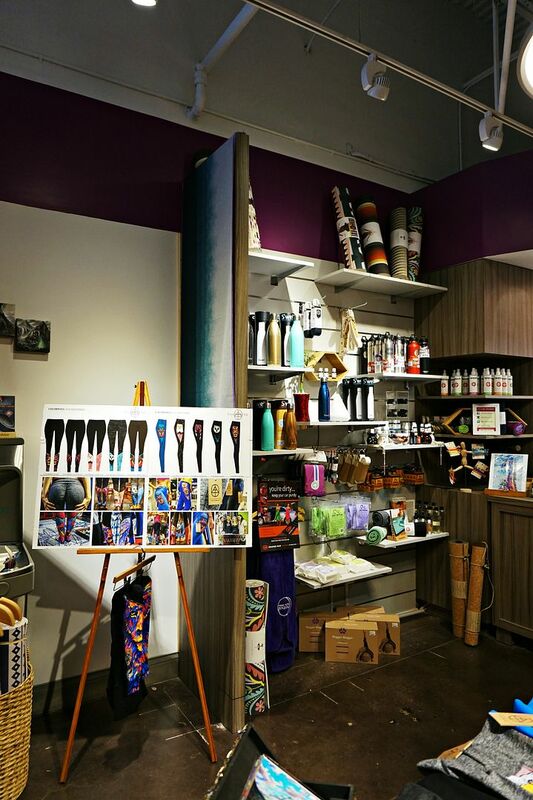 From clothing to mats, jewelry, books, accessories, towels and even S'well bottles; ballball has it all! After getting a private tour of the store which includes artwork from local artists (more on that later! 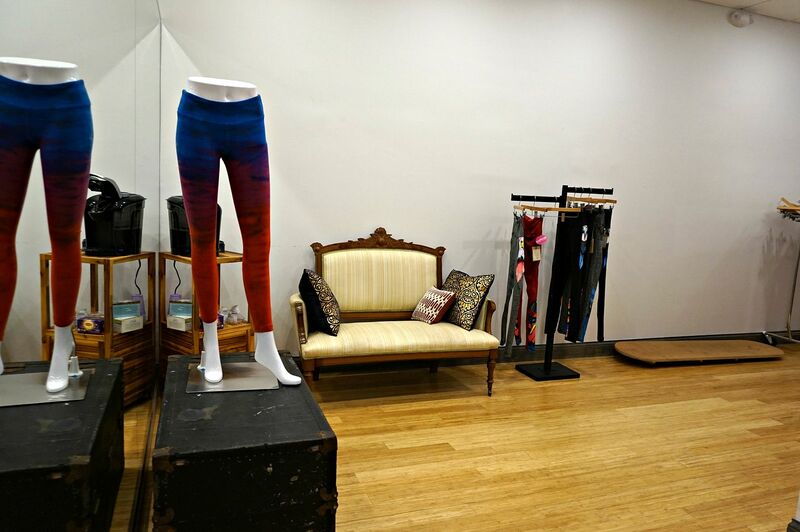 ), and a giant dressing room decked out to resemble a yoga studio we checked out one of the coolest features of the store; a yoga mat testing center. Yup, you read that correctly. 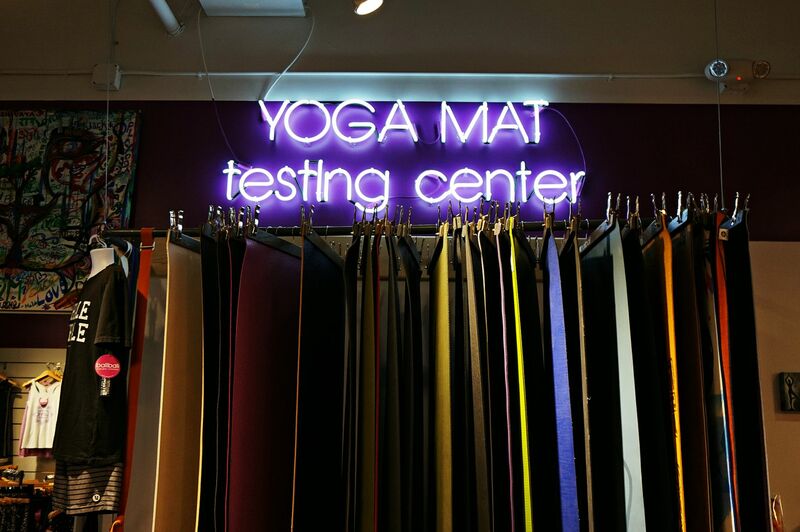 A yoga mat testing center. To be honest, I had never really paid much attention to the difference between yoga mats but after seeing this I have to tell you, there's a difference. We all got the chance to select our own mats and practice on them in a 45 minute yoga session led by a local yoga instructor from a near by yoga studio. The yoga session was just what I needed to unwind from a long day and get my chakras balanced. As if what I've told you about ballball wasn't unique and great enough, the local artwork I told you about earlier? 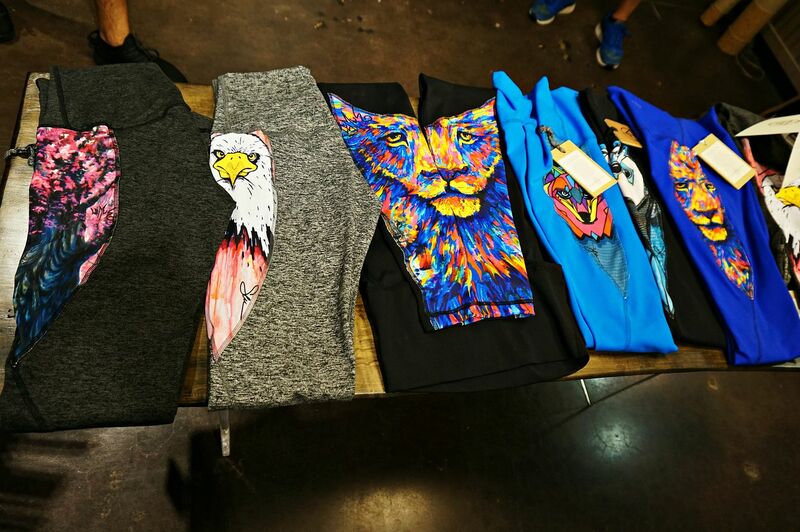 Some of those artists have partnered with ballball's private yoga attire brand, Yogavated to create one of a kind yoga pants. When they say one of a kind, they really mean it so if you love a design you better jump on it fast because once they're sold out of a design they reach out to another local artist to design a new pair and the old designs are gone forever. Such a neat place! At first I thought the title of this post was "baseball yoga" and I was like how did I not know that was a thing! Ha! How cool that you can test out the yoga mats! Genius! What a fun spot and I love how unique all their clothes are and I'm a sucker for a pretty new yoga mat! So cool! I would definitely get into trouble there with so many cute options! Looks like a really cute place! I enjoy yoga, too but don't do it enough. what a fun event! i love all the unique features of that place. definitely going to have to check it out! and those pants with unique artist designs?! amazing! That sounds so amazing! I've always wanted to get into Yoga, but never have really had the chance. This just makes me want to really give it a go! Such a cute place! I've heard so many great things about yoga, I should really give it a shot! So fun!! 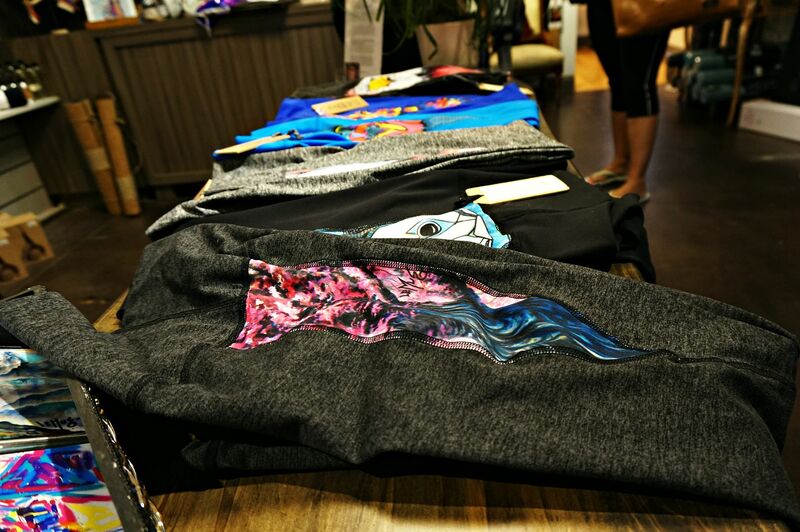 Love the decor of that place and love that local artists design the shirts! So cute! So fun! I need to take a little more yoga - I think my muscles would benefit for sure! That really does sound like a yoga heaven! I love that they support local artists, and I would definitely want to grab anything that I fell in love with quickly! I never would have thought of the difference between yoga mats either, but it totally makes sense now! Awesome shop!!! Cool that yoga goes on right in the middle of it all! This sounds like the cutest yoga shop! My good friend is obsessed with yoga and she would be in yogi heaven in here. I am pretty terrible at yoga because of my lack of flexibility, but I got some basic and easy poses down...mostly I like wearing the yoga pants ;)! Looks like they have some great mats! I will definitely check them out! This is seriously so cool, especially since the shop showcases and supports local artists! This place sounds amazing yet dangerous because I'd be tempted to buy one of everything. I'm just getting back into yoga as well so need some new gear. Where is it located? this is so cool!! :D thanks for sharing! This looks like the cutest place - how fun!! That sounds like the funnest shopping experience. I love that idea! Um, LOVE! This sounds like my heaven! 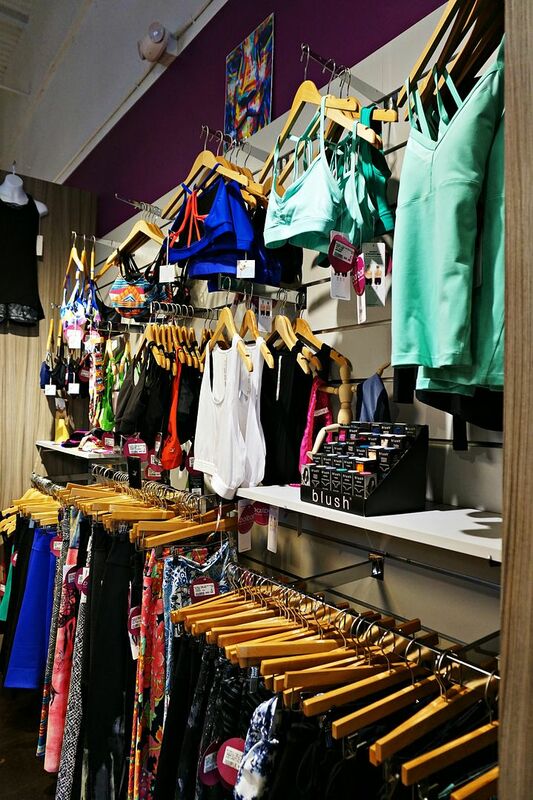 I wish this was closer to me, so much cute workout gear!! This is sooo cool! I love that they include the artwork and there are so many cute workout clothes! Also I love your new(?) blog header! I love that you can try out the mats before you buy one! I wish there was a place like that around here! oh wow, this looks like a shopaholics heaven as well haha. but seriously that yoga mat testing thing is amazing, i have wasted so much money on buying yoga mats online only to find after a few minutes that they just aren't right, for whatever reason. this really does look awesome!